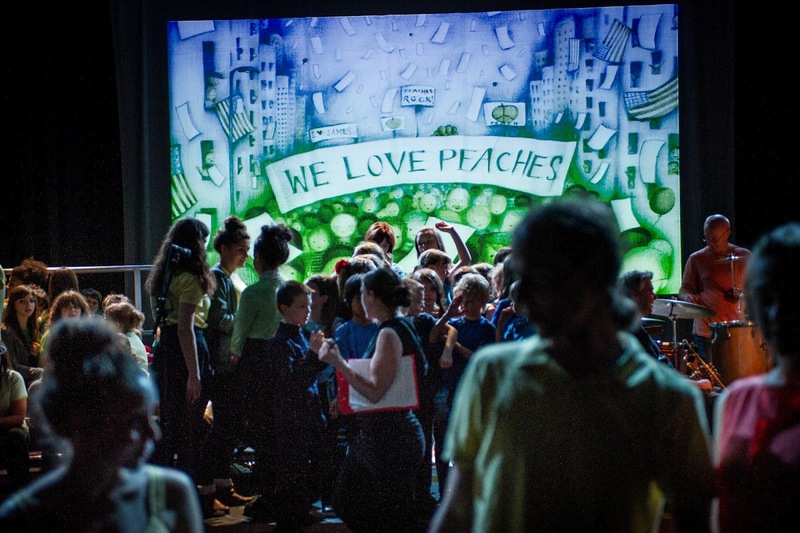 A while back I did this project for Buxton Festival's production of James and the Giant Peach. I produced a number of drawings that were used as backdrops to the performance. It was a great experience all round, especially seeing the final production and my drawings so BIG. For some time now I've sat drawing. And drawing. For around about seven years in fact. Since I picked up my pens, back then, I've never stopped. I've always felt that, because I haven't been drawing for a huge amount of time (relatively speaking), I need to squeeze as much of it into my day, into my life, as possible. This has meant that other areas in my life have suffered and been neglected whilst I just draw draw draw. I've been thinking about this a lot lately. Drawing has become everything to me. It's taken over my life. I feel it might be time to think about redressing the balance. But just thinking about it has thrown me into a bit of a funk. Wondering how I do that - because I still love drawing so much. If anyone has all the answers please let me know. 'Cos, I'm struggling. 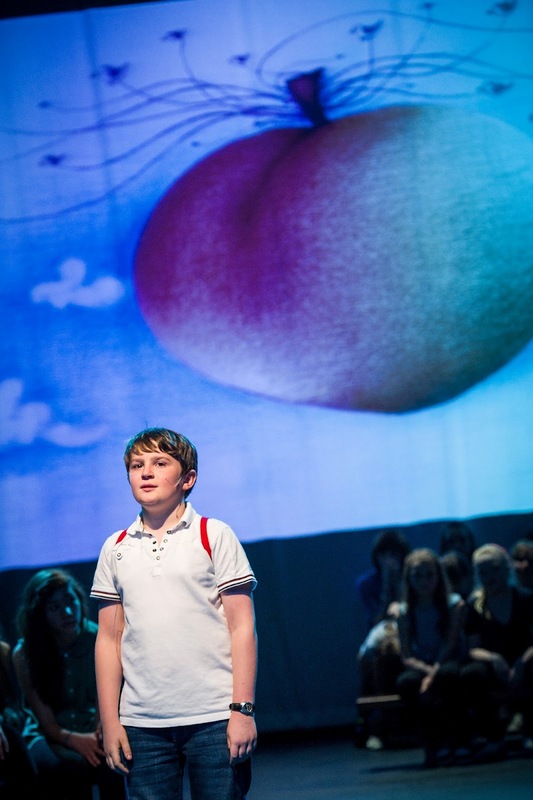 Photographs courtesy of Buxton Festival. All the answers - some would be nice. I'll keep an eye on this post as I have no idea how to balance. Love the backdrops - they look gorgeous! Take a look at why you want to 'redress the balance'. Are the reasons your reasons or other people's reasons? What else (besides drawing) is important to you? Once you know the important stuff, you can make time for all of it, on your terms. The thing that was a breakthrough for me is that I have a choice. There's really no such thing as "I can't" ('Oh, I can't do x, I have to do y'). You are actually choosing to spend your time on something every time a choice comes up. If you choose what feels right to you, and not what you think you 'should'('shoulds' tend to come from outside (family, friends, society)), then you won't feel pulled in two different directions. Sometimes your choices won't please everyone, but since you can't ever do that anyway, there's no point in trying! What you can do is choose your priorities, and then focus on those. Congratulations AJ. I'm so so glad for you. Humans are put on this earth to find what it is that makes them passionately alive and to share that with the world. If drawing is that for you, you're already in balance. Moreso than the rest of this crazy world, for sure. Provided you're not hurting anyone, just live into what you're supposed to do. Draw, lady. Draw like it's your soul made visible. Years ago I was deeply, obsessively into flying. It was on my mind pretty much every waking minute. I remember the panic I felt when imagining the day I didn't do it any more. It seemed like I would lose the core of who I was. The answer was that whether I'm flying or not: once a pilot, always a pilot. The magic will wait for you if you have to take a break. Maybe the answer lies in combining your love of drawing with other things in your life: more sketchcrawls, more sketching with others, teaching your skills to others, or including drawing in those parts of your life that you feel have been neglected. they look amazing on that huge screen! I am in the exact opposite position - an amateur artist who hasn't created regularly for many years. Your blog of wonderful drawings is one of several inspiring me to dust off the sketchbook & supplies. I'm starting my own journey back to regular drawing and blogging about it. Whatever you decide is the right balance for you, thanks for the inspiration and for sharing your talent! eSeN, has the solution I think. The most difficult might be to put into practice maybe. But yes, I guess the only solution to be in peace with our everyday life, is to listen to ourselves as much as possible. You draw a lot, maybe too much in the some peoples eyes, but you do it well, and you don't seem to loose a second of that time spend drawing. It really seams worth it, your work is beautiful Andrea!! Thank you for your passionate dedication, it's a gift to all those who are lucky enough to see your drawings! eSen raises a good point. Death is certain and the time we have is not. What you do with your time is important. The fact that you are fully aware of what you love and that you prioritise it is incredible. So few people know and love themselves enough to do what you do. Even when you think you are drawing every minute, you still make time to do what needs to be done - go to work, clean the clothes, call your Mom, etc - so even though doing these things make you feel cheated of time, I don't think they are part of the balance issue. Balance for me is doing ART as much as I can until that dreadful time when the muse takes a vacation. Then I spend that time doing research and reading, preparing for her return, then, when she does, I do as much ART as I can. That's how I stay balanced. I've been reading a book about visioning (which sounds daft, but actually just seems to mean working out what you want so you can go do it), and had a wee go at it myself. Essentially, you're meant to picture your life in x number of years if everything went just how you always imagined it. Then (in the present tense) you describe in detail the way your spend your week, or how you interact with the people around you. The amazing thing is that it really does make it easier to work out what to do now in order to get there (and it's not always what you think it's going to be). I'm with Aggie, as another amateur artist, (and mother of four teenagers/young adults) I find it a struggle to carve out time each week, never mind each day (which is my goal) to find time to draw and be creative. Relax and enjoy this time you have because before you know it other things will creep in. Thank you for sharing your journey and your achievements, it is always inspirational. eSen talks a great deal of sense - as long as you are not in danger of being evicted, starving to death or hurting anyone, I see no problem in spending your time drawing. It's what you are brilliant at and it is starting to pay dividends. I quit art completely in my early twenties after many setbacks and various people telling me I wasn't good enough. After 13 years, I came back to it and thought to hell with anyone else, I'm going to do what I love. It's been a long hard slog but I can finally call myself a professional artist. Now I feel I have to catch up with those lost years because let's face it, we're a long time dead! From your perspective you have done 'nothing but draw'. However from those of us who have followed you for these years there is more to it than that. There is inspiration (both to spur the artists among us to create more, as well as the sheer joy of seeing the beauty of the world through your eyes), excitement of watching your career develop, and the hope that with all this great work will come greater recognition for you. As I've posted before, your blog is the starting point for student projects in my university drawing classes, which undoubtedly has a ripple effect unforeseen. Next things? More exhibitions, travel, a reality show? Whatever 'it' is will hopefully dovetail with what you do now so we (selfishly) won't lose you. Thank you SO much for the kind response to this post, folks. I have read and reread through all of your comments and appreciate them more than you know. I, too, will respond (to your response! )by posting very shortly. Sorry, I haven't ot around to it sooner, I've just been a bit 'all over the place' recently. For the first time, yesterday, I suddenly felt like drawing and had a deluge of ideas. This makes me happy. A blog post will follow shortly. In the meantime, a HUGE thank you. I'm very touched. I understand how you feel. Re-Adjusting your life when you have a strong passion for something isn't easy at all... If you sit down and really think this through I'm sure you could make an effort to balance out your passion of drawing with other things in your life! with so much wisdom i'm not sure i have much new to add. Beautiful backdrops Andrea. I have no answers either. I am absolutely consumed with making marks. ? ?